Truly ~ I make myself laugh!! When I re-read what I wrote in regard to a 'fabulous' little rug ~ I'm thinking what the devil was I thinking??!! The only thing fabulous about this little mat is that I drew it at 10 o'clock on Weds. night and started hooking it then and finished it last night about 1 a.m.!! We are joining some friends for their anniversary dinner this evening at a wonderful French restaurant in Vermillion and since they have a home on Kelley's Island, I got inspired to hook them something for their house on the lake!! We had been to a Little League game and taken a granddaughter out for her 6th birthday dinner and when we arrived home, it seemed like it was now or never, if I was going to have a handmade gift for them! The last night, we went to two Little League games for two grandsons' teams (I really wanted to go to Chamber After Hours for an adult evening but fortunately, my Gramma mode kicked in) and then we had pizza with my son Teddy and family. So, I finished this late last night, bound it with wool this morning and made a label for it, which I'll stitch on during the ride up to the lake!! The cut is a 9.5, which really helped it to move along fast and I used 3 different teal wools to replicate water ~ one of those wools has a metallic thread running through it ~ I love wool with shiny threads!! Silk ribbon is used to look like whitecaps and the orangy-red is the sunset on the lake and the brighter orange on the right is for the sunrise ~ I used a variety of funky yarns to add a little pizzaz to those bits of weirdness. I don't know if anyone but me will know what those bright spots of color are but I thought it looked kind of artistic!! I hope they it! So ~ off we go to the lake as soon as my husband gets home from a golf outing ~ I hope he isn't have too much fun ~ he's golfing with his son, my son, and our lumber salesman ~ oh, they'll be having fun alright!! Have a good weekend!! This post is to show the progress I made at TWO hook-ins that I went to in the past week!!! Two sets of circles and some background ~ what a hooking whiz I am ~ I'm sure that's what you're thinking!! But I have to tell you ~ Saturday and Tuesday were two of the most fun days for me!! I told a friend by email yesterday, that I wish she had something in her life that brings her as much pleasure as rug hooking does for me! I met wonderful women ~ saw great creative projects that they were hooking ~ saw two wonderful rug shows of finished rugs ~ and of course, had some pretty good food along with it!! It is uplifting to be around these creative souls, each one with a different perspective on what they're hooking and no doubt, why they're hooking. There were so many beautiful wools ~ so many beautiful colors of wool ~ and so many bright spirits in one room, doing what they love to do! I saw gals that I hadn't seen in a long while ~ others that I had just been with a few days before. One lady had been battling a serious illness when we first met at a luncheon at our house ~ now, she is cured!!! That was great news! I met a lady who has been hooking for many years and is well known in our area ~ what a pleasure to talk with her and see her being cheerful and happy to be in that place, in spite of the fact that she had lost her husband just six weeks before. Her daughters c0-chaired the event and no doubt they kept her busy and involved with all the details it took to make that day happen! So ~ no, I didn't get much hooking done at those two gatherings ~ but I had a great time! Tuesday did start out a little hairy since I was driving ~ I missed my exit because my friend, Heidi, and I were engrossed in conversation and when I whipped off at the next exit and jumped back on the freeway ~ oh, well ~ it's too long to tell!! But we made it to the hook-in just in time! !I hope that when a day comes that isn't so much fun, that I can tap into those memories and use all the positive energy that flowed those days to re-create that feeling of joy! I hope you can do that for yourself, as well!! I'm off to finish laundry, office work, get my face sanded (microdermabrasion! ), and get my nails done!! And in my hooking room, I started this fabulous little rug last night ~ can't wait to show it to you tomorrow!! Ta ta for now! This is the group of gals who came lunch Thursday!! Nineteen ladies including two former sisters-in-law, a niece and an aunt who is 96 years old ~ She was amazing ~ they left their hometown at 8 a.m., visited a carousel maker and the local carousel, and then came to our home!! They had a really good time and were a very fun bunch of ladies ~ they were so appreciative of what they ate and what they saw ~ they were wonderful guests! My friend, Vivian, helped me serve and clean afterwards and I couldn't have done it without her help. The menu began with rosemary lemonade, potato-leek soup, frosted jello salad, chicken salad on croissants, bumbleberry pie and coffee ~ and thank goodness, they loved every morsel! After all was said and done, my husband and I went to a Little League game at 5:30 where two grandson's teams were playing against each other!! We took chairs and sat behind the homeplate fence and cheered for both teams! The kids are young enough that they are just glad to play and there wasn't a lot of rivalry ~ they both did well!! Friday we went to the lake ~ met our friends at our favorite Friday afternoon gathering spot for a cocktail or two ~ sat on our beloved rocks in the evening (some did, I crashed on the sofa at 9 p.m. and woke up long enough to walk to bed!). Saturday morning I drove back home to go to a hook-in, which was very fun and I'm so glad I made the effort! There were lots of gals there that I know, met some new ones, and saw beautiful rugs! I drove back to the lake in a pouring down thunderstorm in time to go out for dinner with my charming husband!!!!! And Sunday we had a surprise retirement party for one of our lake friends at the Mon Ami winery ~ that was really fun ~ they have jazz on the lawn on Sunday afternoons ~ a wonderful beginning to Karen's retiring from 31 years of teaching!!! I drove home this morning with my son, Tad, so that I could make a 10:30 a.m. dentist appointment. Sonny left at 5:30 a.m. to get home to start working at 7 a.m. ~ he's afraid he'll get fired if he isn't at work on time!!!! After the dentist, I went to my friend, Donna's, to help her fine tune or stage, as I like to call it, her house ~ she's having her garden club on Friday and likes to have me accessorize her house and place things in the garden to their best advantage. Then we hopped in her car and ran out to find new patio furniture and a couple extra plants ~ in less than two hours we had that mission accomplished and the new plants set in the garden and I headed home before 3 p.m.!!! Donna and I can cover a lot of ground in a short amount of time!! As you can see, my blog is aptly named ~ 'a day in my life' is like a whirlwind ~ not enough hours in the day or days in the week to get done everything I want do ~ so I just keep dancing as fast as I can!! Have a good evening and I hope you're dancing as fast as you can, too!! and he's looking quite dandy, I think!! Sunday night, I spent some latenight time down in my rug hooking room and am happy to say his body is done!!! And I changed the colors in the last set of border circles ~ this is definitely more pleasing to my eye!! I have ten colors to work with and have laid them out in an order that works for me. I hook in each color, in order, and separate them with the black of the border ~ by using 10 colors in the circles of three ~ they look very random ~ but it's like a planned hit-and-miss! My friend, Heidi, taught that to me! In the previous Catfish post, I inverted the order of the colors and it definitely needed changed ~ I'm not very fond of 'reverse hooking' and when I do, you know it was very necessary! This looks great to me now and I could really get on a roll with this border, if only I had time to sit down and hook!! In 36 hours , I will be entertaining the 20 Red Hat ladies that my former sister-in-law is bringing to our home! We haven't actually been related for over 28 years, but I like to keep people in my life for as long as they'll have me!! She is bringing her daughter, another former sister-in-law (that I have remained very close to), and my former husband's 92 year old aunt in addition, to the other Red Hat ladies in her group!! I serve them a homemade luncheon, along with the home and garden tour ~ I think they'll have a really good time!! Tomorrow, I'll be cooking up a storm, in between getting these gray hairs colored and going out to supper with some of our lake friends, who are stopping by, and I'll also be putting finishing touches on the outside! Thank goodness, I have a cleaning lady ~ she'll stir up some dust inside for me!! That's today's story ~ I think I'll put this to bed and myself, as well. I would like to get to the 'Y' early in the morning to continue my commitment to exercise on a regular basis ~ wish me luck!! This weekend was a deuzy!! This picture is of my friend and I at our lake place ~ she and I have been friends for 50 years!!!! She and her daughter came for an overnite visit and we laughed and carried on just like we used to!! Good therapy!! We went to school together only one year, but have stayed in contact these many years! And while I was at the lake having fun, my husband and I became great grandparents!! They planned for her to be born today but nature intervened and the new addition to our family came on Friday the 13th. The father of this little bundle is the young man who graduated last week ~ a new story begins! We wish the best for this new family and hope the universe blesses them and embraces them! They came to our Father's Day gathering yesterday as a surprise for all of us ~ these young gals are resilient! ~ and there was a hush when they set the baby carrier down ~ all the little kids (6 of them) sat on a bench and were quiet like mice ~ it was very cute!!! My husband's son and wife are the new grandparents ~ way too young for such stuff ~ just like me and Grandpa!!! Yikes!! Saturday afternoon, I drove home from the lake and we went to two graduation parties that evening!! One for a great niece who graduated from college with a dance major and is going to work on a cruise ship as part of the entertainment!! That's pretty exciting as she is hoping for a career in dance and that seems like a good starting point!! Today I have been to the 'Y' to exercise, and to the greenhouse and now I'm going out to adorn the garden areas with annuals to punch up the color!! Thursday is the day the Red Hats come ~ 20 of them ~ for lunch, and a house and garden tour!! I better get going!!! They'll be knocking on the door before I know it ~ time flies, you know, when you're having fun ~ and I'm having a blast!!!! most days of the week!! I had a customer come at 10 a.m. and a friend stop by shortly after. Then a trip to Loudonville to look at something a gal picked up for me but it wasn't what I wanted, so that was an unnecessary jaunt! Then I worked in the garden for several hours ~ making things look good for next week! And a friend called and reminded me that we were having a gathering here Thursday evening of a few neighbors and friends ~ that works great for me ~ whatever comes out of a bag or a deli container and a bottle will be the fare for the evening!!!!!!! I came in from the garden about 9 p.m. and did a little office work and then I decided you all needed to see what I accomplished at the lake this weekend ~ I haven't hooked this week here at home at all! The fish body is done except for one space that I couldn't decide the color ~ I figured it out but forgot to hook it in before I took it off the frame ~ so that will be the first thing I do at the next sitting and then his flipper tail!! I worked a bit on the circle border but not sure if I like the color placement next to the one that had been done a while ago ~ I'll figure that out next time, too! This is how we spent yesterday afternoon!!! It was 92 degrees and graduation was outside in the sun ~ fortunately a breeze was blowing or we would have all melted!! 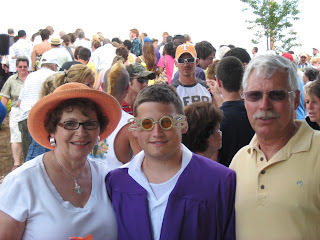 The happy graduate is Nick, the oldest of our 10 grandchildren ~ somehow when our kids graduated, I never thought about the fact that we would be on those bleachers again ~ that time rolled around quickly!! The big party was a week ago but we went back to the kids' house for burgers and dogs ~ one last Hoorah!! As for the 2008 glasses ~ they were from New Years Eve and perfect for yesterday! Sonny and his son went on the fishing trip Friday and Brian won $50 for catching the most fish ~ walleye ~ and took us out to breakfast Saturday with his winnings!! It's a good day when the kids pay the bill!! His wife came up to the lake, too, and we had some fun ~ shopping, and hanging out on the rocks with our friends! This has been a busy week but it didn't include much hooking!! My Canadian cousins came for a visit Sunday, Monday, Tuesday ~ I was so glad to see them! As is usual for my life ~ they came a day early!!! Fortunately, I got groceries earlier in the day on Sunday after saying to my husband "what if they came today?!!" (I'm a little psychic!)!!!! So when they called and said they were two hours away ~ this old girl went into action and things were pretty ship-shape when they backed their 30' travel trailer down our driveway!!! And once again ~ I fired up the stove and cooked a couple of breakfasts and a pretty good dinner on Monday and called for pizza the night they arrived!!! If I keep this up, my husband will think I should cook like this every day!!!!!!! Here are some garden pix for you to look at ~ we have a beautiful waterfall that Sonny dug and built by hand ~ we have the perfect terrain that just screamed 'waterfall'! Our property is an old gravel pit and just lends itself to interesting landscaping areas ~ we even have rock formations called 'puddingstone' that were left by the glacier!! In the close-up of the pond, you can catch a glimpse of the goldfish ~ there are six of them and they've made it thru two winters now ~ their parents weren't so lucky!!!!! One of my secrets to great looking pots is to buy hanging combination pots ~ put the entire basket in big clay pots and cut off the hangers!!! They add lots of color and no work to assemble ~ I scour the greenhouses and pick what I think are the very best combinations to adorn our gardens!! We're off to the lake for the weekend ~ Sonny and his son are going on a fishing trip tomorrow with a bunch of local guys and I'll spend the day with one of the other wives and my daughter-in-law is coming up, too! I'm sure a little shopping and a little lunching will be involved! The kids (our 40 year old kids) will stay over and hang out with us and our friends tomorrow night ~ I hope they're up to it!!!! And I hope to get some hooking time in!!! Happy weekend to you! !